The interior of our country might feel like it's all farms and cornfields, but if you look closely, you'll find that it's actually filled with natural wonders worth exploring! Calm, sandy lake shores, dense forests, and rolling hills make the landscape of America's heartland an unexpected beauty. Encompassing an area that is almost entirely covered by water, Voyageurs National Park is best explored by boat. It's not surprising that the park, which contains four major lakes, is located in Minnesota, nicknamed the "Land of 10,000 Lakes." If you choose to rent a boat (houseboats and canoes are popular), you can camp out at one of the sites only accessible by water, hike around the shores, and do some fishing. If you're crunched for time, stop by one of the visitor centers; some even offer ranger-led boat tours. Cabin O Pines is a resort located on the shores of Pelican Lake. Campsites and cabins, boat rentals, and hiking make this a great home base for exploring the forested wilderness of northern Minnesota. Pro tip: To get a different view of the landscape, take a float plane tour! Pattison State Park is a forested gem that is a perfect retreat into nature. The secluded campgrounds are an awesome place to spend the night, but the coolest feature of the park is its waterfalls. Pattison is home to the tallest waterfall in Wisconsin, Big Manitou Falls, as well as to the smaller Little Manitou Falls, and has several trails offering various views of the waterfalls. Okay, so there are a ton of farms in the Midwest... but if you camp out at Wisconsin's Red Barn Campground, you'll leave with a new appreciation for the region's farming past. Mini-golf, hay rides, animals that you can feed and pet, a merry-go-round, and, of course, the activity room in the refurbished barn will provide endless fun before you drift off to sleep at your campsite! Lakes, moraines, rolling fields, and trails galore can be found at Chippewa Moraine State Recreation Area. Also, the Ice Age National Scenic Trail passes through the park. The flat, wide-open landscapes and rich soil for growing lush greenery across the region are all courtesy of the Ice Age, so stop by the visitor center here to learn more about the prehistoric past of the Midwest. Pewitts Nest Canyon is a shaded gorge, lined with green moss and ferns, is a great hidden gem of a hike. The babbling stream and rocky waterfalls add to the effect-- it looks like something straight out of Lord of the Rings! The Great Lakes are a main feature of the Midwest. The massive freshwater bodies of water provide sandy shores, rugged coastline, excellent boating opportunities, and, of course, sand dunes, which are always fun to hike. Indiana Dunes State Park offers swimming and hiking as well as rolling dunes to climb and jump off of. And if you find yourself spending more time here than planned, get a site at the Indiana Dunes Campground and make a day of it! Another lakeshore beach on Lake Michigan, Warren Dunes State Park has great sandboarding and sledding and beautiful foliage in the fall, which is best enjoyed on a hike along one of the park's winding trails. You'll find a campground here, as well. Lake Hudson State Recreation Area offers the swimming, boating, fishing, forest hiking, and camping you'll find at many parks across Michigan, but what sets it apart from other spots is its designation as an International Dark Sky Preserve. That means that it's recognized as offering outstanding stargazing, thanks to its remote location and lack of light pollution. Bring a telescope or binoculars if you have them, and enjoy the views after the sun sets! The shores of the Great Lakes are dotted with scenic lighthouses. But beyond their quaintness, many, such as Marblehead Lighthouse, allow visitors to climb to the top and take in the views of the lake from a new angle. You can also explore the museum onsite and learn all about the fascinating maritime history of the Great Lakes. Pull into the Timber Ridge Campground for a fun overnight stay! Ice cream socials, weekly bingo, an arcade, an indoor pool, and tons more, all set in the scenic forests of northern Ohio, make this the perfect stopover on your way to Cuyahoga Valley National Park! 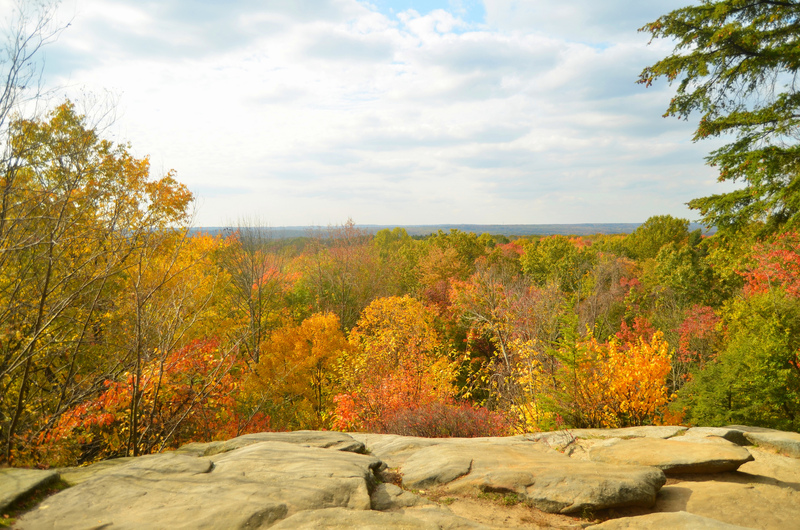 It's hard to believe, but not that long ago, Cuyahoga Valley National Park was partially covered by a toxic dump. Now, it's been cleaned up and restored to its former woodland beauty. Cuyahoga Valley is all about relaxing in nature and going back to a simpler time, when life was a little slower... and the region's history as a quiet farm community supports that. Whether you're taking a scenic train ride through the park, or you're heading out on a serene hike, you'll definitely leave feeling relaxed and recharged. From lakeshore dunes to woodland serenity, the landscapes of the Midwest aren't showy... but they are beautiful, and make for a road trip filled with both adventure and relaxation.